This isn’t a story about ghosts. It’s a story about Ghostwalkers—people with a genetic marker that allows them to die, visit the spirit realm to help earthbound spirits cross over into the light, and come back to life. It’s quite the party trick. Blake is an experienced Ghostwalker whose Anchor recently retired. An Anchor’s job is to take care of the Ghostwalker before and after he travels to the spirit realm. Blake is very emotional when he re-enters his body; he shakes and cries and has a hard time calming down. When Blake meets his new partner, Derek, he isn’t happy. And it’s not personal. Blake doesn’t want another man to see him so vulnerable. He also can’t seem to stop lusting after the gorgeous and nurturing Derek (and the feeling is very much mutual). Let’s talk about Derek for a moment. Derek is a DREAMBOAT: tall, dark, handsome, caring, kind, AND he cooks. I can’t even. Blake is one lucky man, especially considering Derek isn’t just his Anchor; he’s his Anchor mate. I like paranormal stories, but they aren’t always done well. On the surface, Ghost of a Chance sounds vaguely ridiculous, particularly since the interpretation of ghostwalking isn’t metaphorical. Blake literally dies with a sword wound to the chest; he bleeds, suffers, and gasps for breath (talk about hurt/comfort at its finest!). This all sounds really gruesome, but somehow it works. I completely believed in this paranormal universe where an agency like Requiem—which hires Ghostwalkers, Anchors, mediums, and others with specials gifts—exists. The potential for angst is high, but Derek and Blake have an incredibly loving and close relationship. Blake is scared of losing Derek (Ghostwalkers typically live longer than other humans), yet he can’t help but be drawn to Derek’s smile, his smell, and his chocolate chip cookies. Blake is white, while Derek is African-American, but the interracial aspect of the relationship isn’t an issue at all. What Blake has to figure out is how to ghostwalk when his very soul is constantly drawn back to Derek. The romance is tender, and the lovin’ is hot! The ending is perfection (I wanted more tension than we got, but I’ll take it). 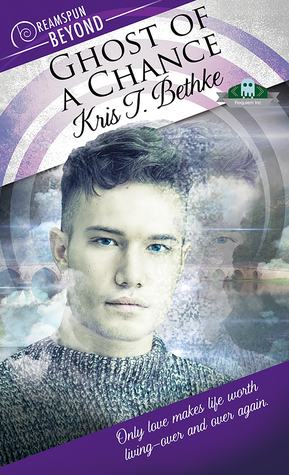 I am thrilled that Kris Bethke is expanding this book into a series, because Blake’s brother Sam, also a Ghostwalker, needs to find his HEA. A person who won’t read has no advantage over one who can’t.